Baking is a form of alchemy—the art of turning mundane everyday ingredients into something extraordinary. Alison Thompson has studied at the sides of some of the world's greatest pastry chefs for years, learning the art and science of baking. 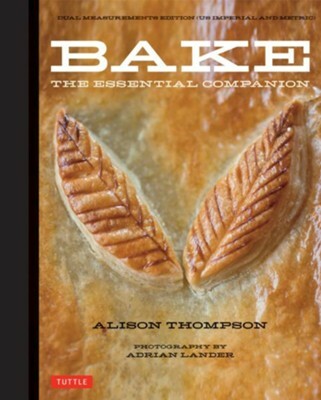 In Bake: The Essential Companion, Alison shares the creations that continue to delight her clientele and her family. There's a recipe here for every occasion and every part of your meal—dinner, side dishes and, of course, dessert! With more than 200 mouthwatering recipes including her all-time favorite bread recipes, cakes and cookies, Alison also presents dozens of unique pastry recipes that you normally only find in a specialty pastry shop. She even includes a section on gluten free baking with over 20 gluten free recipes. With this baking cookbook at your side you'll become adept at conjuring some amazing baking magic—it's like taking a baking class in the comfort of your own home! Alison Thompson has been passionate about cooking since she was a child, writing her first cookbook when she was just 11 years old. She now has 15 years experience under her belt as a professional chef and pastry chef. Alison has worked with some of the finest pastry chefs in the world. She is the founder and head pastry chef of Alison Louise Designer Cakes, a wedding and special occasion cake business. In 2010 she published her first book, Macaron. She lives in Australia. I'm the author/artist and I want to review Bake: The Essential Companion.